A spinal fusion is often a necessary step for patients with a deteriorated or unstable spine that is causing them pain. This is one of the many procedures available at Tahoe Fracture & Orthopedic Medical Clinic’s Reno, Nevada, location. During a spinal fusion, the surgeon works to stabilize your spine by removing the damaged disc and implanting a bone graft to join the surrounding vertebrae. Doing so decreases the motion at that segment of the spine, thereby reducing any resulting pain. The bone graft may be taken from your hip (known as an “autograft bone”), taken from a donor (known as an “allograft bone”), or manufactured. At Tahoe Fracture & Orthopedic Medical Clinic’s Reno, NV, location, we often perform spinal fusions together with other spinal procedures, such as discectomies, foraminotomies, and laminectomies. After undergoing a spinal fusion, it may take several months for the fused bone to become solid, so it is imperative that you keep your spine properly aligned during that time to maintain stability and promote healing. 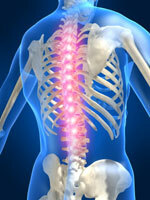 In some cases, a surgeon may insert rods, plates, and screws during the procedure to keep your spine in place. We also often recommend that you wear a brace to keep your back in proper alignment. The rehabilitation specialists on our staff will also work with you to ensure that you follow the proper methods for walking, standing, and sitting following the procedure. If you’ve experienced back pain resulting from any of the above conditions, please contact Tahoe Fracture & Orthopedic Medical Clinic’s Reno, NV, location so that we can help you determine whether you may be a candidate for a spinal fusion. Our orthopedic specialists will help you work toward restoring your function, mobility, and quality of life.